SHIAO LIN, Taiwan (CNN) -- More than 1,300 people are still trapped in remote mountainous villages in southern Taiwan, victims of treacherous mudslides and floods from Typhoon Morakot, the country's semiofficial Central News Agency said Saturday. 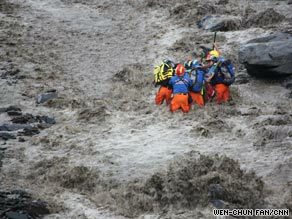 Rescuers brave raging torrents to pull survivors from mudslides in Taiwan. Rescue officials quoted by the news agency said 1,373 were trapped, and 75 helicopters were scheduled to conduct rescue missions Saturday in the counties of Kaohsiung, Pingtung, Taitung and Chiayi. The storm hit last weekend, dropping 2.6 meters (102 inches) of rain on Taiwan. After hitting Taiwan, Morakot roared on to mainland China on Sunday, killing at least six people and displacing 1.4 million, authorities said. The toll was much higher in Taiwan, where the storm was blamed for killing 123 people, according to the latest figures from Taiwan's National Disaster Prevention and Protection Commission. Mary Yu, spokeswoman for the commission's Central Emergency Operation Center, said 53 people were unaccounted for. Despite the obstacles, 2,518 people were rescued on Saturday, Yu said. Southern and central Taiwan were hardest hit by the storm. Mudslides flattened some places in southern Taiwan, including the small village of Shiao Lin. Authorities believe hundreds of people could be trapped under five stories of mud in the village. A memorial service was being held under a tent where framed pictures of the dead were crowded on tables. "He's gone, he's gone, that one's gone, all these grandchildren are gone," said a tearful Yu Chin Chih. She lost 10 members of her family. "We went to Shiao Lin village for the first time yesterday to look for their bodies. But then I realized there's nothing you can do. We couldn't find them," she said. Rescuers on Friday tried to determine whether the mud there was stable enough to bring in excavators to begin searching for bodies. Since the typhoon made landfall over the weekend, more than 31,000 people have been pulled from villages, according to official government figures. Chen Chiu Lian, 76, who lives in Shiao Lin with her teenage grandson, Wang Hsin Hong, described the moments when the typhoon hit. "I had just finished eating. My grandson was taking a nap. It rained and rained. There was water to my left and to my right ... The next day, it was still raining. She said their home was the only one left in the village where about 160 once stood. The two eventually were rescued by a helicopter from the roof of the house, Chen said. They went to stay with friends. Earlier in the week, the six-story Jinshuai Hotel in Jhihben collapsed into the Jhihben River after its foundations were eroded by surging floodwaters. Media reports showed the building toppling into the water with a huge splash. Those inside had already been evacuated.